Buckingham Female Collegiate Institute: Antonia Ford | slate river ramblings . . . .
Antonia J. Ford was born on July 23, 1838, in Fairfax Court House, the daughter of Edward Rudolph Ford, a wealthy merchant, and Julia F. Ford. In 1857, she attended the Buckingham Female Collegiate Institute in Buckingham, Virginia. 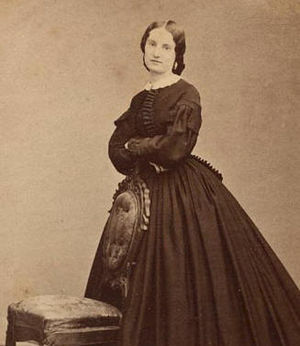 During the Civil War, her brother Charles Ford served with Stuart’s cavalry, and Ford herself became acquainted with the general and began supplying him with information. Histories have traditionally cited Ford’s youth and beauty as the assets she used in intelligence gathering. When her father opened the family’s home—which was located halfway between Washington, D.C., and Manassas—as a gathering spot for Union officers, she had ample opportunity to charm Union soldiers and steal their secrets. She is said to have sometimes worked in conjunction with Rose O’Neal Greenhow, a Confederate agent in Washington, D.C. On October 7, 1861, Stuart presented Ford with a “commission” as an honorary aide-de camp, ordering she be “obeyed, respected and admired” as such. Instead, however, the document helped get her thrown in jail. For the rest of Antonia’s story, visit Encyclopedia Virginia, Antonia Ford (1838—1871).